On April 24, 2016, audience members were treated to an experience like no other. 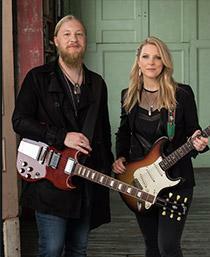 Susan Tedeschi, Derek Trucks, and their 10-piece band filled the stage–the old cotton storage shed on the Dockery property–with their inimitable sound that combines Memphis soul, electric rhythm & blues, country and rock. Coming to play on this historic site meant a lot to the band, and as Derek said, "We first heard about it like a lot of other folks, from liner notes of old blues records, reading about Charley Patton and Howlin’ Wolf, and we recently saw this clip with B.B. King on the property talking about how this is where it all started, so for us just as fans of the music like everyone else, it’s going to be a bit of a pilgrimage to go back to where all this great music happened and really where a lot of American music really sprung from." To make sure you’re kept informed about any future events at Dockery, please email us to be added to our mailing list.